We recieved an email from Steven Holl Architects about this crazy project. I hope this message finds you well. 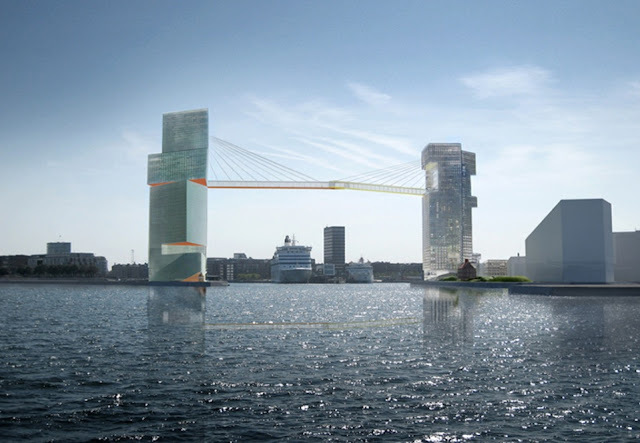 Upon reading your article on Steven Holl Architect’s project in Copenhagen, Copenhagen Gate, Gate L & Gate M, I’d like to clarify concerning cyclists using the new bridge. Though it was initially requested by the city that bridge be for cyclist use, as the design now moves forward it is no longer to be used for cyclists and alternative solutions are being pursued. It appears that the city will not follow up on its original tender requesting a design for a bridge between the towers and certainly not one that will accommodate bikes. Which is a good thing. Scroll to the bottom of this article to see a simple idea that could be upgraded with modern designs. Then, today (26 November 2015), this article appeared in the Danish paper, Politiken. Basically, the latest and possibly last word on this project is that there might be a bridge, but it will be private, not public. Too many challenges with keeping an aerial cycle track open to the public 24/7. The City is looking at other options. The towers will be built, but the goofy flying cycle track ain't gonna be all that. 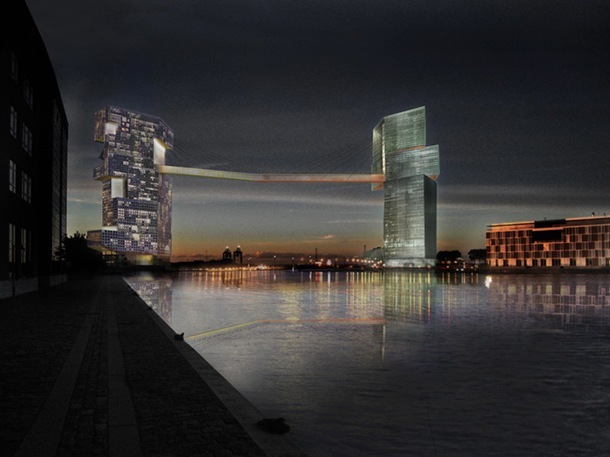 Copenhagen has built or is building seven new bicycle bridges. In Copenhagen, they're called bicycle bridges, but we assume that there will also be pedestrian access - and there always is. But in the City of Cyclists, our perception is that a bridge ain't functional if it isn't for bicycles. The news here is that yet another bridge has gotten the go ahead. If the elevated cycle track we call the Bicycle Snake / Cykelslangen captured our imagination, have a look at the new kid on the block, above. A covered bicycle and pedestrian walkway 65 metres above the harbour. Leading from one tower to another. American architect Steven Holl won the competition for Marmormolen - or Marble Pier - back in 2008 but the financial crisis slowed stuff down in Denmark for a while. Now the project is green-lighted. This project is called LM Project. The towers will be built at the head of the part of the harbour that houses the world's third-busiest cruise ship port. The height of the elevated facility is due to the massive size of most (horribly unsustainable) cruise ships. At first glance one might think either "why bother" or "goofy gimmick", but the elevated cycle track and walkway wasn't an architect's whim. 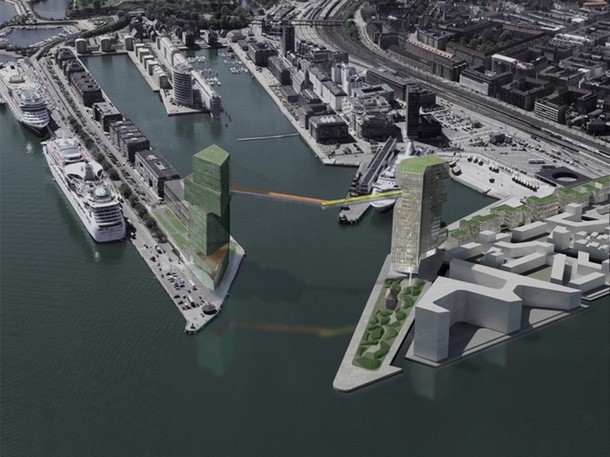 It was actually in the City of Copenhagen's tender material when the project was launched. A tower on each side connected by a bridge at least 65 m in the air. The reason is logistics and city policy. There has to be maximum of 500 metres from any home in Copenhagen to public transport, be it a bus stop, train station or metro station. 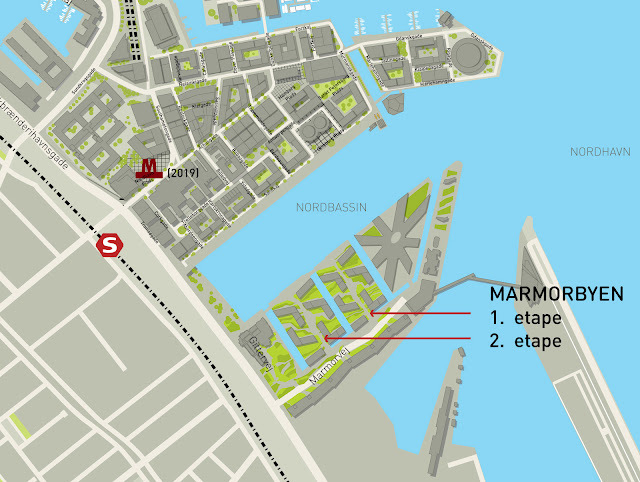 If you look at the map, above, you can see that the tower on the right, at the end of Langelinie pier, would be much farther away from Nordhavn train station and the coming metro station, at left. If you had to walk or ride a bike all the way around. Therefore, with the elevated facility, people in the tower on the right will be within 500 metres of the stations and bus stops. Personally, I think it's a bit wild, but I know that it is necessary to stick to the fine policy of access to public transport. It will never be a main route for any great number of cyclists or pedestrians but it will be an important connection as the city continues to grow. It still adheres to the basic principles of Danish Design: Functional, Practical and Elegant. 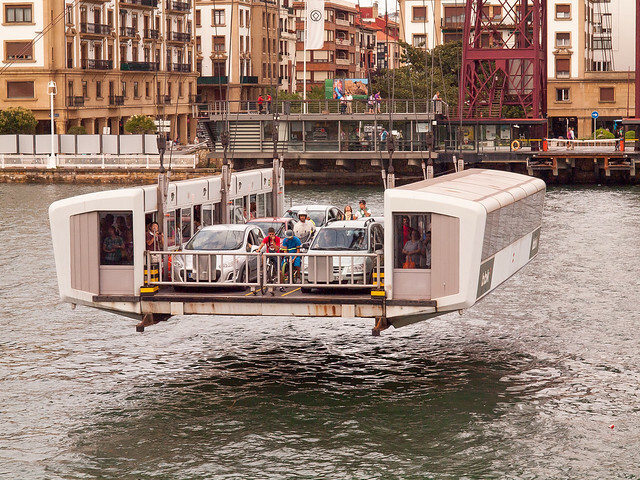 Okay, maybe it lacks thorough practicality - taking a large, bicycle-friendly elevator up to the clouds to cross a harbour head is not exactly a smooth, efficient transport flow. But the function as a link across the water is clear. Construction of the buildings and elevated facility will commence in 2016. After digesting the news of this bridge, we wonder if it really is the best solution. Like so much else, cool stuff has already been invented. 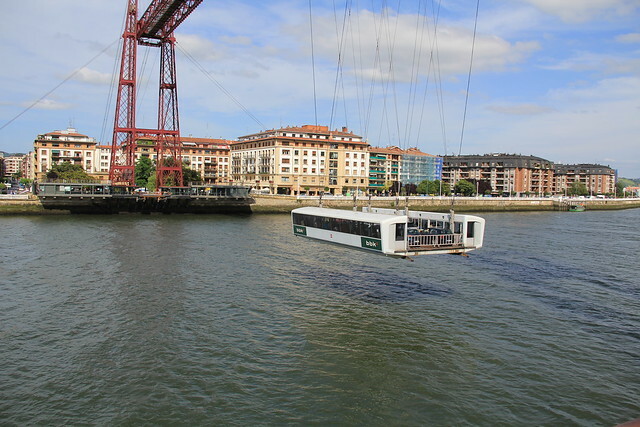 Look at the Puente de Vizcaya in Bilbao, dating from 1893. Same issues were tackled. Large ships passing by and yet the need to connect two shores. Four million people use this bridge every year. It takes a minute and a half to glide from one side to the other. There is no way that the Copenhagen solution, above, is going to take 90 seconds. Once again, a simpler solution has already been invented and has worked fine for over 120 years. We started this article with a reserved level of enthusiasm and then ended up with a feeling of WTF.